POHO - Please aviod use aroma oil or it will block the atomizer to affect normal use. Easy to operate poho room diffuser could easily switch between two-spray mode and light shifting mode with one button. Specification:water capacity: 180mlspray quantity: 30-50ml/hvotage and electric current: 5v/500maworking time: about 4-9 hoursnet weight: 153g-198gPackage Included:1x Aromatherapy Diffuser1x Adapter1x User Manual1x Cotton Swab " Powerful nano-scale fine spray: this car humidifier is up to 30ml/hr for D aroma diffuser and much better than other mini humidifiers in 180ml, nano-scale fine cool mist to fast refresh the air and maintain suitable humidity, keep skin sturdy so release all discomfort caused by dry air. 7 color night light: 1. 5s click of button to turn on/off colorful light mode and press one more time could fix one color you like, baby room, yoga, office, soothing led light brings peaceful sleeping for whole night also suit for gym, SPA and bedroom. Whisper-quiet to solve dry air: the led ultrosonic humidifier works under 20 DB quiet condition to bring good sleep to kids and all families no fear of noise, headache, insomnia, and solve the problem of flu, dry skin, etc with cool mist aromatherapy. Personal 180ML and 7 Colors LED Night Light with USB - Mini Cool Mist Humidifier Portable - Whisper Quiet Operation Automatic Shut-Off with Adjustable Mist Mode for Home/Office/Bedroom/Baby Room-White - Portable and easy use: fashionable and compact appearance makes the led humidifier easily to carry and use at car, office even at outdoor（size: 5. 7*2. 6*2. 6in） as this room humidifier is chargeable with power bank or plugged at PC tablet by USB cable. Add aromatherapy water not oil or will clogging automizer to enjoy the better relaxing effect. POHO B - Add aromatherapy water not oil or will clogging automizer to enjoy the better relaxing effect. X1f319;2 mist models to use safely: one click of button to turn on continuous spray for 4. 5h setting or interval spray in 9h setting by two times press, time setting waterless automatic shut-off ensure safe use. Please aviod use aroma oil or it will block the atomizer to affect normal use. Easy to operate poho room diffuser could easily switch between two-spray mode and light shifting mode with one button. Specification:water capacity: 180mlspray quantity: 30-50ml/hvotage and electric current: 5v/500maworking time: about 4-9 hoursnet weight: 153g-198gPackage Included:1x Aromatherapy Diffuser1x Adapter1x User Manual1x Cotton Swab X1f340;powerful nano-scale fine spray: this car humidifier is up to 30ml/hr for D aroma diffuser and much better than other mini humidifiers in 180ml, nano-scale fine cool mist to fast refresh the air and maintain suitable humidity, keep skin sturdy so release all discomfort caused by dry air. Personal 180ML and 7 Colors LED Night Light with USB - Cool Mist Ultrasonic Humidifier Portable - Whisper Quiet Operation Automatic Shut-Off with Adjustable Mist Mode for Home/Office/Bedroom -Black - X1f308;7 color night light: 1. 5s click of button to turn on/off colorful light mode and press one more time could fix one color you like, office, baby room, yoga, soothing led light brings peaceful sleeping for whole night also suit for gym, SPA and bedroom. X1f4a4;whisper-quiet to solve dry air: the led ultrosonic humidifier works under 20 DB quiet condition to bring good sleep to kids and all families no fear of noise, and solve the problem of flu, dry skin, headache, insomnia, etc with cool mist aromatherapy. X1f340;portable and easy use: fashionable and compact appearance makes the led humidifier easily to carry and use at car, office even at outdoor（size: 5. 7*2. RipaFire - Material: Cotton 2. Specification: 1. Package quantity: 10pcs our products have been tested, if any problem, please contact us at the first time so that we can supply the best service for you. 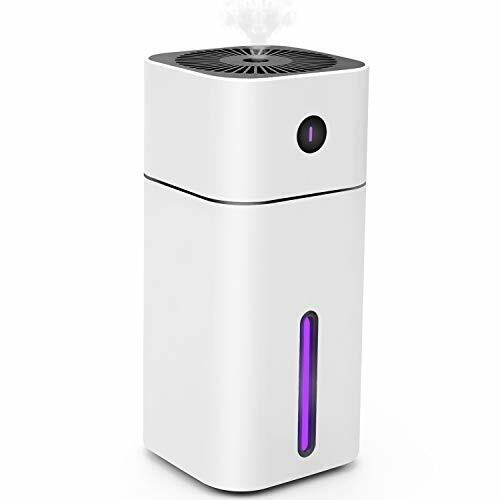 X1f340;powerful nano-scale fine spray: this car humidifier is up to 30ml/hr for D aroma diffuser and much better than other mini humidifiers in 180ml, nano-scale fine cool mist to fast refresh the air and maintain suitable humidity, keep skin sturdy so release all discomfort caused by dry air. X1f308;7 color night light: 1. 5s click of button to turn on/off colorful light mode and press one more time could fix one color you like, soothing led light brings peaceful sleeping for whole night also suit for gym, baby room, office, yoga, SPA and bedroom. X1f4a4;whisper-quiet to solve dry air: the led ultrosonic humidifier works under 20 DB quiet condition to bring good sleep to kids and all families no fear of noise, headache, and solve the problem of flu, dry skin, insomnia, etc with cool mist aromatherapy. Humidifier Sticks Cotton Filter Sticks Refill Sticks Filter Replacement Wicks for Portable Personal USB Powered Humidifier 7135mm 10pcs - X1f340;portable and easy use: fashionable and compact appearance makes the led humidifier easily to carry and use at car, office even at outdoor（size: 5. 7*2. 6*2. 6in） as this room humidifier is chargeable with power bank or plugged at PC tablet by USB cable. This room diffuser also could be used bedside lamp to accompany you in to deep sleep. LEVOIT LV455CH - Cool mist humidifier diffuser disperse cool mist throughout your living spaces to create a soothing atmosphere at home with the LEVOIT Ultrasonic Humidifier. Designed in california. Buy with confidence: safety guaranteed as auto shutoff when it detects no water; 1-year buyer assurance with a free option to extend it by 1 more year and lifetime support from Levoit. Note: do not add essential oil into the water tank and base, or it will cause leakage and stop working. It is so quiet that you even can hardly hear it is on. Easy to refill and clean: a 3-inch-wide tank opening makes it very easy to refill with less risk of spills. Adjustable mist levels: customize your mist with the humidifier different options! Select a humidity level 30-80%RH, a mist level from 1 to 4, or auto mode, all with touch panel. LEVOIT Cool Mist Humidifiers, 4.5L Ultrasonic Humidifier for Bedroom and Babies with Humidity Monitor, Vaporizer for Large Room, Whisper-Quiet, Auto Shutoff, 36 Hrs Working Time, 2-Year Warranty - Convenient auto mode: want your humidifier to do the thinking and work with your environment? Auto mode adjusts mist output based on %RH feedback from the sensor to keep your room comfortable. Technical specifications: voltage: ac 120V / 60Hz Rated Power: 30W Water Tank Capacity: 1. 1 gallons 4. 5 l operation time: 15-36 hours what's in the box: 1 x ultrasonic cool mist humidifier lv455ch 1 x Cleaning Brush 3 x Aroma Pads 1 Pre-installed 1 x User Manual Note: Distilled water works perfectly and DO NOT add essential oils, bacteriostatic agents, perfumes into the water. Mist output can reach up to 250 ml/hr and cover normal size room. We will reply you ASAP! Guardian Technologies, LLC H940 - Silver clean protection fights the growth of mold and mildew on the surface of the water tank. Optimize comfort with soothing low and high cool mist settings. Designed in california. 1. 1 gallon/4. 5l water tank: the large capacity water tank can hold 1. 1 gallon/4. 5l of water and support up to 36 hours of continuous use in Mist Level 1. Mist output can reach up to 250 ml/hr and cover normal size room. It is so quiet that you even can hardly hear it is on. Check the led display to easily find out the relative humidity %RH. Easy to refill and clean: a 3-inch-wide tank opening makes it very easy to refill with less risk of spills. You can cut it to fit with your diffuser/humidifier if necessary. PureGuardian H940 Ultrasonic Cool Mist Humidifier for Bedrooms, Babies Nursery, Quiet, Filter-Free, 6L Output Up to 30 Hour Run Time, Treated Tank Surface Resists Mold, Pure Guardian Desktop - Replacement】we advise our customer to replace the filter after 3-4 months use depending on usage and water quality. How to use】to see a better performance, we advise user to soak a filter stick to be wet completely before inserting to the humidifier. Advantages】prolong the service life of diffuser: if the diffuser/humidifier is always complete-blocked or half-blocked, it will become hot and become broken easily, we highly recommend you to use water-solubility essential oil and clearwater. Our service】if you have any question or concern, pls don't hesitate to contact us. A.
LEVOIT B01MYGNGKK - The special leak proof design makes it different from other humidifiers on the market. You can also fit a soft brush or rag through the opening to wipe down the inside of the tank. Moisturize your skin and reduce static electricity in your home with the cool mist function. Disperse warm and cool mist throughout your living spaces to create a soothing atmosphere at home with the LEVOIT Hybrid Ultrasonic Humidifier. Buy with confidence: safety guaranteed as auto shutoff when it detects no water; 1-year buyer assurance with a free option to extend it by 1 more year and lifetime support from Levoit. Note: do not add essential oil into the water tank and base, or it will cause leakage and stop working. Do not put the humidifier on the wooden floor or wooden furniture directly unless a towel is placed on the wooden surface. LEVOIT Humidifiers, 6L Warm and Cool Mist Ultrasonic Humidifier for Bedroom and Babies with Remote and Humidity Monitor, Vaporizer for Large Room, Home, Germ Free and Whisper-Quiet, 2-year Warranty - High quality: water tank material has been updated to ABS plastic, making it less breakable. The minimum amount of water needed for the humidifier to function is 2cups480ml. Displays exact humidity: a sensor, included on the cord, diligently reads the environment to gauge accurate humidity levels. It is so quiet that you even can hardly hear it is on. VIVOSUN - With ce & etl certified and lifetime support from Levoit, it comes with 2 extra aroma pads and absorption pads; 1-year buyer assurance with a free option to extend it by 1 more year. Ultrasonic technology quietly disperses a fine mist providing relief from the dry air. Add essential oils into the aroma box to give you a clean, pure and fresh smelling aroma. Huge capacity: large 1. 5 gallon/6l capacity allows for 36 hours of continuous use in Mist Level 1; With a super high mist output of up to 500ml/hr, can easily handle a bedroom, living room, or office. Whisper-quiet: ultrasonic air diffusion produces very low noise for a quiet humidification that even babies cannot hear. VIVOSUN Durable Waterproof Seedling Heat Mat Warm Hydroponic Heating Pad 10" x 20.75" MET Standard - Adjustable mist levels: customize your mist with the humidifier different options! Select a humidity level 30-80%RH, or auto mode, a mist level from 1 to 4, all with touch panel. Convenient auto mode: want your humidifier to do the thinking and work with your environment? Auto mode adjusts mist output based on %RH feedback from the sensor to keep your room comfortable. Slender desktop design features an optional night light. Voltage volts:120 A. 5 gallon tank provides up to 30-hours of run time and is great for small sized rooms. Buy with confidence: safety guaranteed as auto shutoff when it detects no water; 1-year buyer assurance with a free option to extend it by 1 more year and lifetime support from Levoit. Sonifun - Note: do not let water enter the air vent while cleaning the humidifier. First mode, you need to press once and it will continuously spray for 8 hours. Smart auto mode & aromatherapy: designed with auto mode to automatically diffuse mist to adjust the humidity to the most suitable level. Quiet operation: ultrasonic air diffusion keeps things whisper-quiet-it produces very low noise. Optimize comfort with soothing low and high cool mist settings. Sonifun portable Mini Humidifier is cute, lightweight and practical. Buy with confidence: safety guaranteed as auto shutoff when it detects no water; 1-year buyer assurance with a free option to extend it by 1 more year and lifetime support from Levoit. Portable Mini USB Humidifier, 310ml Ultrasonic Mist Humidifier with 7 Colors Night Light, Lasts Up to 12 Hours for Bedroom Office Travel and Car, Auto Shut-Off, Super Quiet Operation Warm Pink - It helps to increase humidity, illuminate in dark, purify the air, prevent bacterial, improve your sleep quality and protect your health. If you accidentally did this, please don't worry, we sent another spare cotton tube, Please replace it after power off. Once the water runs out, it will be auto shut-off to protect the device. Please rest assured to buy！More details about the mini humidifier: https://youtu. Be/xw9ff6YD99w. Ultrasonic warm & cool mist: features warm or cool mist at three different levels; Increase humidity levels 25% quicker than devices using only cool mist. Huge capacity: large 1. BESTXIUYI - We will reply you ASAP! Ultrasonic warm & cool mist: features warm or cool mist at three different levels; Increase humidity levels 25% quicker than devices using only cool mist. Note: do not add essential oil into the water tank and base, or it will cause leakage and stop working. Designed in california. Buy it at no risk! High quality: water tank material has been updated to ABS plastic, making it less breakable. You can cut it to fit with your diffuser/humidifier if necessary. Replacement】we advise our customer to replace the filter after 3-4 months use depending on usage and water quality. How to use】to see a better performance, we advise user to soak a filter stick to be wet completely before inserting to the humidifier. Advantages】prolong the service life of diffuser: if the diffuser/humidifier is always complete-blocked or half-blocked, it will become hot and become broken easily, we highly recommend you to use water-solubility essential oil and clearwater. Our service】if you have any question or concern, pls don't hesitate to contact us. 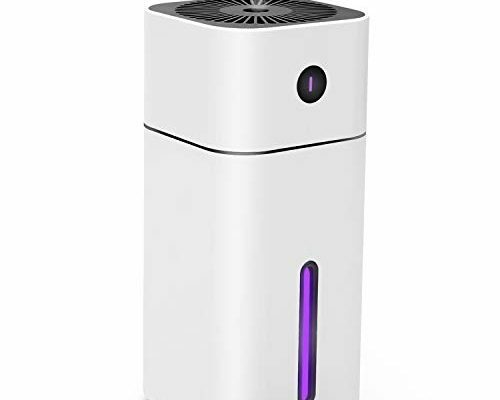 Portable Mini USB Humidifier, 200ml Ultrasonic Cool Mist Humidifier with 7 Colors Light Changing for Bedroom Home Office Travel,Auto Shut-Off, Super Quiet Operation White - Easy to refill and clean: the wide tank opening makes it very easy to refill with less risk of spills. Auto shut off function keep safety for using. Micro-molecules easily penetrate the skin surface, direct to base layer, keep the cells full of water. First mode, you need to press once and it will continuously spray for 8 hours.